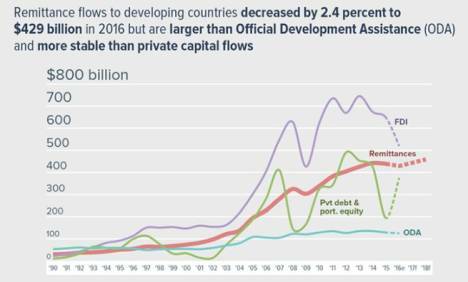 WASHINGTON - Remittances to developing countries fell for a second consecutive year in 2016, a trend not seen in three decades, says the latest edition of the Migration and Development Brief, released on Friday at the World Bank’s spring meetings. The bank estimates that officially recorded remittances to developing countries amounted to $429 billion in 2016, a decline of 2.4 percent over $440 billion in 2015. Global remittances, which include flows to high-income countries, contracted by 1.2 percent to $575 billion in 2016, from $582 billion in 2015. Low oil prices and weak economic growth in the Gulf Cooperation Council (GCC) countries and the Russian Federation are taking a toll on remittance flows to South Asia and Central Asia, while weak growth in Europe has reduced flows to North Africa and Sub-Saharan Africa. The decline in remittances, when valued in US dollars, was made worse by a weaker euro, British pound and Russian ruble against the US dollar.